Hodge family establishes endowment fund in memory of the family's matriarch, Beverly "Bev" Hodge to give back to the Dubuque Public School Wellness Programs. 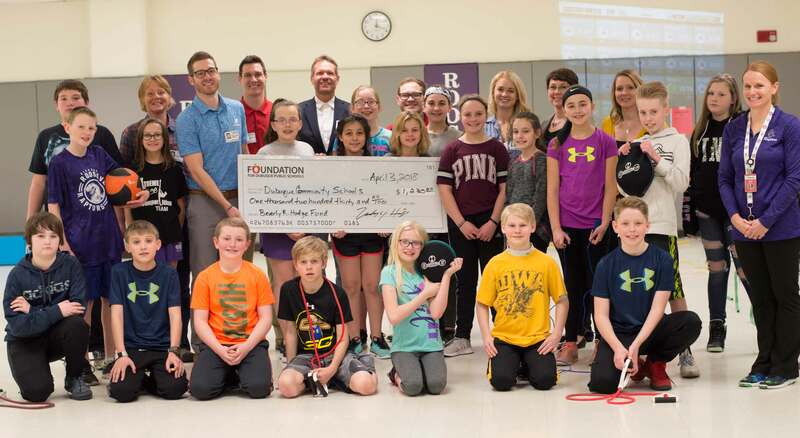 DUBUQUE, IOWA – The Beverly R. Hodge Fund distributed its first grant of $1,230 to the Dubuque Community School District, in support of a new resistance training kit for use in school gym classes. The Hodge fund was established in 2017 in memory of Beverly Hodge, the family’s matriarch. It is a permanent endowment, overseen by the Foundation for Dubuque Public Schools (FDPS) in partnership with the Community Foundation of Greater Dubuque. As the fund grows, the annual earnings are used to provide grants in support of students in the Dubuque Community School District now, and forever. This year’s grant marks the fund’s first annual endowment payout, which will continue in perpetuity. “Grandma Bev was an extremely generous and fun-loving lady that believed in giving back to her community, particularly in support of youth development programs and initiatives," said Zach Hodge. "She instilled those values in the rest of us, so we decided to carry on her legacy with help from the Foundation for Dubuque Public Schools. Through the Beverly R. Hodge endowed fund, we’ll be able to support students in the public school system in projects surrounding wellness, extra-curricular activities, and entrepreneurship that may not otherwise be possible. These are the types of programs that Grandma loved to support, and we know she’d be so proud to see us giving back." The Foundation for Dubuque Public Schools support student achievement by promoting investment in the Dubuque Public Schools. FDPS is a nonprofit organization committed to providing resources for all students of the Dubuque Community School District.